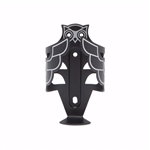 Get an Owl and make your ride fly. Black Carbon Outside and Silver Carbon Inside. Special Rubber Grommet Secures all Water Bottles. Super Lightweight. Weight: 23 Grams. Colors: Silver, Red, Blue.